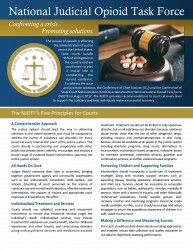 The National Judicial Opioid Task Force, co-chaired by Tennessee Administrative Office of the Courts Director Deborah Taylor Tate, recently launched a resource center to address the ongoing opioid epidemic featuring dozens of facts sheets, videos, and other resources for judges and the general public regarding the opioid crisis and substance abuse disorders including treatment and services; special populations, including children and veterans; and collaborative efforts and data sharing among law enforcement medical professionals and the judicial branch. “These educational materials were created in response to our courts being flooded with cases from foster care to bankruptcy to theft due to the opioid crisis. While this resource center began with our judges in mind, it can also be utilized by families being impacted by this epidemic every day,” said Director Tate. In 2017, there were 70,237 drug overdose deaths in the United States, up almost 10 percent in one year. In addition, millions suffer from addiction and deaths relative to heroin are up 533 percent since 2012. The tiniest victims include thousands of babies born each year with neonatal abstinence syndrome— one every 25 minutes nationwide. According to the Tennessee Department of Health, 1,776 Tennesseans died from drug overdoses in 2017, more than died from automobile crashes. In addition, there were 7,943 nonfatal overdose inpatient stays in Tennessee in 2016. “State courts nationwide have been overwhelmed with the opioid epidemic and the national task force was created to find solutions and resources for judges on the front lines,” stated Indiana Chief Justice and National Co-Chair Loretta Rush. “As a former juvenile judge, I have seen the impact on families and wanted to arm our Judges with life-saving tools to get citizens the right treatment for the right time in the right place." The National Judicial Opioid Task Force, created by state supreme court chief justices and court administrators, in 2017, has divided its work into three workgroups: Children and Families, Civil and Criminal Justice, and Collaboration and Education. All three workgroups contributed to the creation of the resource center. Some of the materials found in the resource center include information on involuntary commitment and guardianship laws for persons with a substance disorder; medication assisted treatment options; fentanyl, carfentanyl, and their analogs in the courthouse; and understanding the basis of addiction. There is also an ongoing series of educational webinars available. The work is supported by a grant from the State Justice Institute. Judge Slone and Tennessee addiction medicine expert Stephen Loyd M.D. are featured in a compelling video on the resource center on Understanding Addiction: A New Perspective, which explains the physiology of addiction and the science of cravings. Judge Slone is a nationally recognized leader in addressing the opioid epidemic in the courts and is also featured extensively on his creation of recovery oriented compliance strategy in the courts, which links defendants with addiction, mental, and behavior issues with resources while requiring accountability. The resource center also includes comprehensive information from a variety of other experts including the U.S. Department of Health and Human Services, the National Institute for Drug Abuse, American Academy of Pediatrics, USDA rural opioid initiative and other federal and state agencies as well as service providers and nonprofit organizations. “The judiciary is in a unique position to promote collaboration among different agencies, across branches and even between state judicial systems,” Director Tate added. “There is a tremendous amount of work to be done. But through innovation and cooperation, I know we can have an immeasurable impact on those who need us most.”In addition to the creation of this extensive resource center, the National Judicial Opioid Task Force has also worked with federal and state law enforcement partners to create data sharing, partnerships, and policies; improved access to federal funding for state courts; and presented at numerous national conferences and summits to showcase innovative collaborations that are working across the nation. In addition to the creation of the resource center, the National Judicial Opioid Task Force has also worked with federal and state law enforcement partners to create data sharing, partnerships, and policies; improved access to federal funding to respond to the opioid epidemic; and presented a numerous national conferences and summits. Director Tate, Judge Slone, and many others across the Tennessee judiciary have been involved in several other state and regional opioid projects. Judge Slone is the chair of the Regional Judicial Opioid Initiative, which includes eight states, and the Tennessee Judicial Opioid Initiative. Both organizations focus on bringing leaders and policymakers from different branches of government and sectors to share data and information that can lead to innovation, collaboration, and solutions. The judicial branch has also played a key role in the TN Together initiative. Current TJOI projects include the development of a discipline specific guide for justice systems stakeholders and mapping of treatment providers that commit to meet criteria established by TJOI in order to maximize our opportunities to help the justice involved population achieve the best outcomes. In the immediate future both RJOI & TJOI will be launching websites. The RJOI website will include information about our current projects as well as highlight initiatives related to the Opioid Driven Addiction Crisis of each of our member states. TJOI will highlight ongoing our current projects plus serve as a Resource Center for Tennessee justice systems stakeholders.